Slope mass-wasting triggered by rainfall is a complex phenomenon and representsan important hazard in most mountainous regions. In-situ monitoring of the involved processes is difficult due to harsh environmental conditions and the fact of remote monitoring sites.The present work shows examples of monitoring data gathered in two test sites, where shallow landslides and torrential processes produce slope mass-wasting. 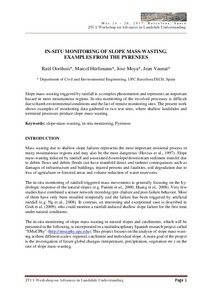 Oorthuis, R., Hurlimann, M., Moya, J., Vaunat, J. In-situ monitoring of slope mass-wasting: examples from the Pyrenees. A: JTC1 Workshop on Advances in Landslide Understanding. "JTC1 Workshop Advances in Landslide Understanding: proceedings of the First JTC1 Workshop: Advances in Landslide Understanding, Barcelona, Spain, May 24th-26th, 2017". Barcelona: International Centre for Numerical Methods in Engineering (CIMNE), 2017, p. 105-108.